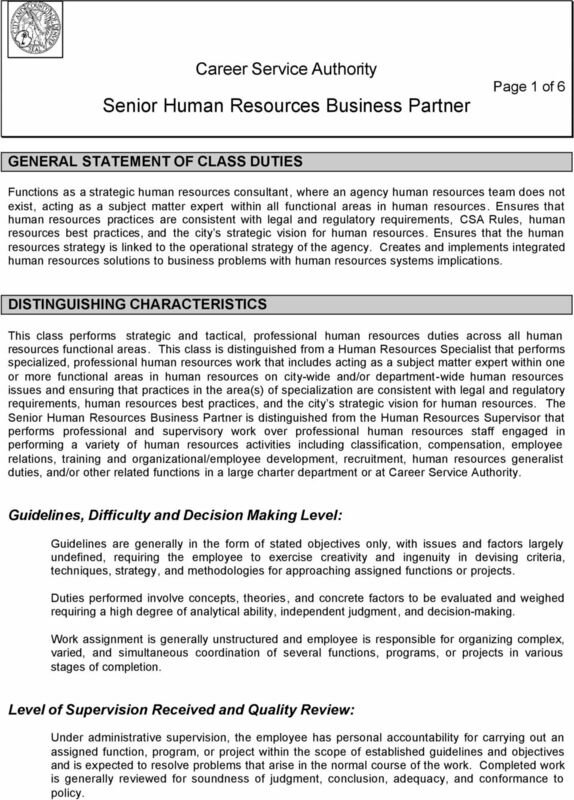 Download "Senior Human Resources Business Partner"
1 Career Service Authority Senior Human Resources Business Partner Page 1 of 6 GENERAL STATEMENT OF CLASS DUTIES Functions as a strategic human resources consultant, where an agency human resources team does not exist, acting as a subject matter expert within all functional areas in human resources. Ensures that human resources practices are consistent with legal and regulatory requirements, CSA Rules, human resources best practices, and the city s strategic vision for human resources. Ensures that the human resources strategy is linked to the operational strategy of the agency. Creates and implements integrated human resources solutions to business problems with human resources systems implications. DISTINGUISHING CHARACTERISTICS This class performs strategic and tactical, professional human resources duties across all human resources functional areas. This class is distinguished from a Human Resources Specialist that performs specialized, professional human resources work that includes acting as a subject matter expert within one or more functional areas in human resources on city-wide and/or department-wide human resources issues and ensuring that practices in the area(s) of specialization are consistent with legal and regulatory requirements, human resources best practices, and the city s strategic vision for human resources. The Senior Human Resources Business Partner is distinguished from the Human Resources Supervisor that performs professional and supervisory work over professional human resources staff engaged in performing a variety of human resources activities including classification, compensation, employee relations, training and organizational/employee development, recruitment, human resources generalist duties, and/or other related functions in a large charter department or at Career Service Authority. 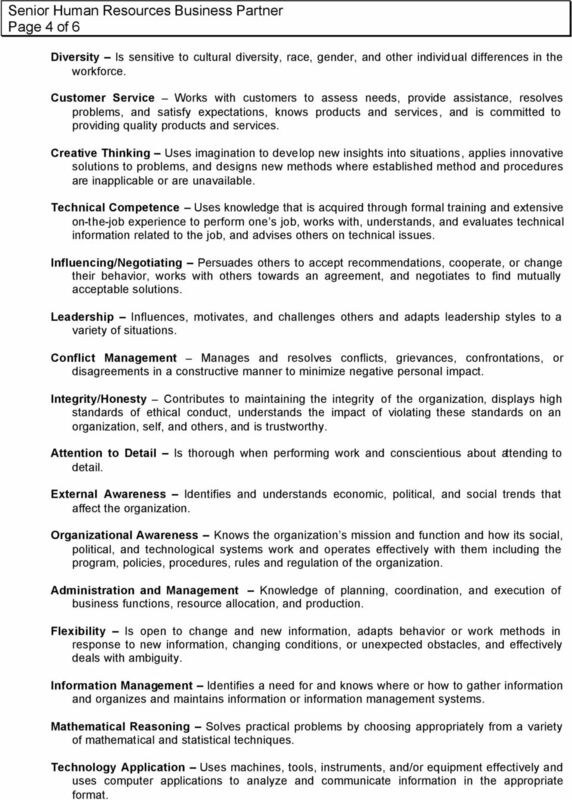 Guidelines, Difficulty and Decision Making Level: Guidelines are generally in the form of stated objectives only, with issues and factors largely undefined, requiring the employee to exercise creativity and ingenuity in devising criteria, techniques, strategy, and methodologies for approaching assigned functions or projects. Duties performed involve concepts, theories, and concrete factors to be evaluated and weighed requiring a high degree of analytical ability, independent judgment, and decision-making. Work assignment is generally unstructured and employee is responsible for organizing complex, varied, and simultaneous coordination of several functions, programs, or projects in various stages of completion. Level of Supervision Received and Quality Review: Under administrative supervision, the employee has personal accountability for carrying out an assigned function, program, or project within the scope of established guidelines and objectives and is expected to resolve problems that arise in the normal course of the work. Completed work is generally reviewed for soundness of judgment, conclusion, adequacy, and conformance to policy. 2 Page 2 of 6 Interpersonal Communications and Purpose: Contacts of a remedial nature involving the resolution of problems and where some degree of discretion and judgment are required in carrying out a major program and/or function of the organization. Level of Supervision Exercised: By position, performs lead work. By position, performs supervision over clerical and/or technical staff. 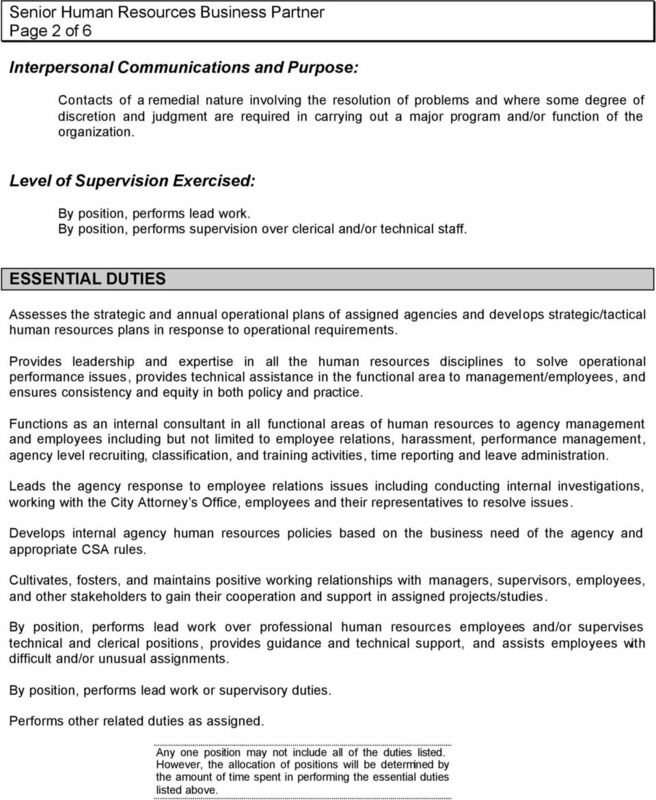 ESSENTIAL DUTIES Assesses the strategic and annual operational plans of assigned agencies and develops strategic/tactical human resources plans in response to operational requirements. Provides leadership and expertise in all the human resources disciplines to solve operational performance issues, provides technical assistance in the functional area to management/employees, and ensures consistency and equity in both policy and practice. Functions as an internal consultant in all functional areas of human resources to agency management and employees including but not limited to employee relations, harassment, performance management, agency level recruiting, classification, and training activities, time reporting and leave administration. Leads the agency response to employee relations issues including conducting internal investigations, working with the City Attorney s Office, employees and their representatives to resolve issues. Develops internal agency human resources policies based on the business need of the agency and appropriate CSA rules. Cultivates, fosters, and maintains positive working relationships with managers, supervisors, employees, and other stakeholders to gain their cooperation and support in assigned projects/studies. By position, performs lead work over professional human resources employees and/or supervises technical and clerical positions, provides guidance and technical support, and assists employees with difficult and/or unusual assignments. 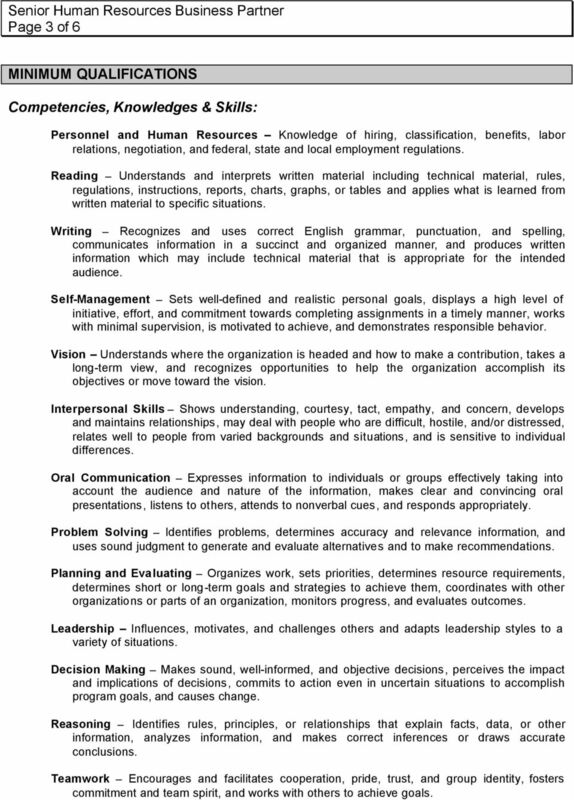 By position, performs lead work or supervisory duties. Performs other related duties as assigned. Any one position may not include all of the duties listed. However, the allocation of positions will be determined by the amount of time spent in performing the essential duties listed above. 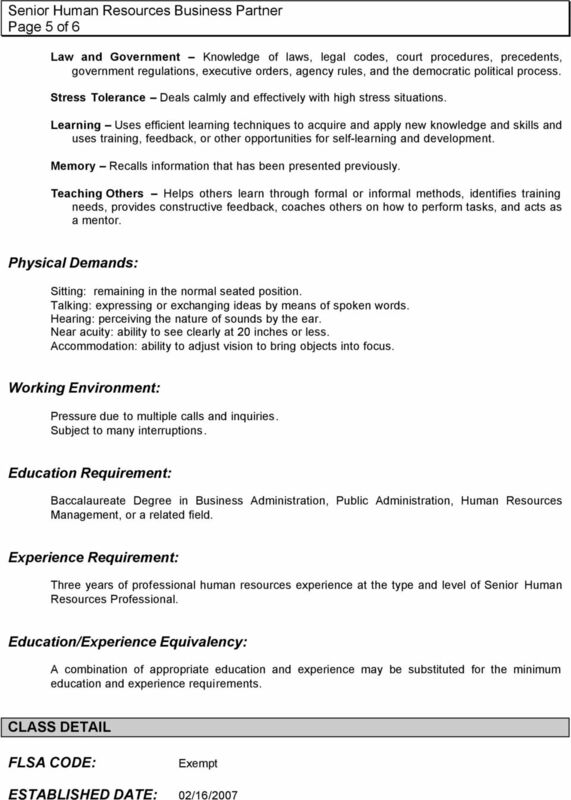 3 Page 3 of 6 MINIMUM QUALIFICATIONS Competencies, Knowledges & Skills: Personnel and Human Resources Knowledge of hiring, classification, benefits, labor relations, negotiation, and federal, state and local employment regulations. Reading Understands and interprets written material including technical material, rules, regulations, instructions, reports, charts, graphs, or tables and applies what is learned from written material to specific situations. Writing Recognizes and uses correct English grammar, punctuation, and spelling, communicates information in a succinct and organized manner, and produces written information which may include technical material that is appropriate for the intended audience. Self-Management Sets well-defined and realistic personal goals, displays a high level of initiative, effort, and commitment towards completing assignments in a timely manner, works with minimal supervision, is motivated to achieve, and demonstrates responsible behavior. Vision Understands where the organization is headed and how to make a contribution, takes a long-term view, and recognizes opportunities to help the organization accomplish its objectives or move toward the vision. Interpersonal Skills Shows understanding, courtesy, tact, empathy, and concern, develops and maintains relationships, may deal with people who are difficult, hostile, and/or distressed, relates well to people from varied backgrounds and situations, and is sensitive to individual differences. Oral Communication Expresses information to individuals or groups effectively taking into account the audience and nature of the information, makes clear and convincing oral presentations, listens to others, attends to nonverbal cues, and responds appropriately. Problem Solving Identifies problems, determines accuracy and relevance information, and uses sound judgment to generate and evaluate alternatives and to make recommendations. Planning and Evaluating Organizes work, sets priorities, determines resource requirements, determines short or long-term goals and strategies to achieve them, coordinates with other organizations or parts of an organization, monitors progress, and evaluates outcomes. Leadership Influences, motivates, and challenges others and adapts leadership styles to a variety of situations. Decision Making Makes sound, well-informed, and objective decisions, perceives the impact and implications of decisions, commits to action even in uncertain situations to accomplish program goals, and causes change. Reasoning Identifies rules, principles, or relationships that explain facts, data, or other information, analyzes information, and makes correct inferences or draws accurate conclusions. Teamwork Encourages and facilitates cooperation, pride, trust, and group identity, fosters commitment and team spirit, and works with others to achieve goals. 4 Page 4 of 6 Diversity Is sensitive to cultural diversity, race, gender, and other individual differences in the workforce. Customer Service Works with customers to assess needs, provide assistance, resolves problems, and satisfy expectations, knows products and services, and is committed to providing quality products and services. Creative Thinking Uses imagination to develop new insights into situations, applies innovative solutions to problems, and designs new methods where established method and procedures are inapplicable or are unavailable. Technical Competence Uses knowledge that is acquired through formal training and extensive on-the-job experience to perform one s job, works with, understands, and evaluates technical information related to the job, and advises others on technical issues. Influencing/Negotiating Persuades others to accept recommendations, cooperate, or change their behavior, works with others towards an agreement, and negotiates to find mutually acceptable solutions. Leadership Influences, motivates, and challenges others and adapts leadership styles to a variety of situations. Conflict Management Manages and resolves conflicts, grievances, confrontations, or disagreements in a constructive manner to minimize negative personal impact. Integrity/Honesty Contributes to maintaining the integrity of the organization, displays high standards of ethical conduct, understands the impact of violating these standards on an organization, self, and others, and is trustworthy. Attention to Detail Is thorough when performing work and conscientious about attending to detail. External Awareness Identifies and understands economic, political, and social trends that affect the organization. Organizational Awareness Knows the organization s mission and function and how its social, political, and technological systems work and operates effectively with them including the program, policies, procedures, rules and regulation of the organization. Administration and Management Knowledge of planning, coordination, and execution of business functions, resource allocation, and production. Flexibility Is open to change and new information, adapts behavior or work methods in response to new information, changing conditions, or unexpected obstacles, and effectively deals with ambiguity. Information Management Identifies a need for and knows where or how to gather information and organizes and maintains information or information management systems. Mathematical Reasoning Solves practical problems by choosing appropriately from a variety of mathematical and statistical techniques. Technology Application Uses machines, tools, instruments, and/or equipment effectively and uses computer applications to analyze and communicate information in the appropriate format. 6 Page 6 of 6 ESTABLISHED BY: CLASS HISTORY Bruce Backer This is a new class.